Wangari Muta Maathai was born in Nyeri, Kenya (Africa) in 1940. The first woman in East and Central Africa to earn a doctorate degree. Wangari Maathai obtained a degree in Biological Sciences from Mount St. Scholastica College in Atchison, Kansas (1964). She subsequently earned a Master of Science degree from the University of Pittsburgh (1966). She pursued doctoral studies in Germany and the University of Nairobi, obtaining a Ph.D. (1971) from the University of Nairobi where she also taught veterinary anatomy. She became chair of the Department of Veterinary Anatomy and an associate professor in 1976 and 1977 respectively. In both cases, she was the first woman to attain those positions in the region. 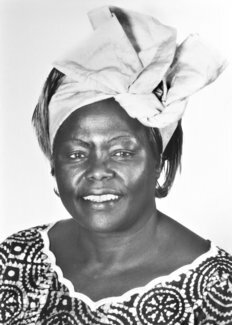 Wangari Maathai was active in the National Council of Women of Kenya in 1976-87 and was its chairman in 1981-87. It was while she served in the National Council of Women that she introduced the idea of planting trees with the people in 1976 and continued to develop it into a broad-based, grassroots organization whose main focus is the planting of trees with women groups in order to conserve the environment and improve their quality of life. However, through the Green Belt Movement she has assisted women in planting more than 20 million trees on their farms and on schools and church compounds. 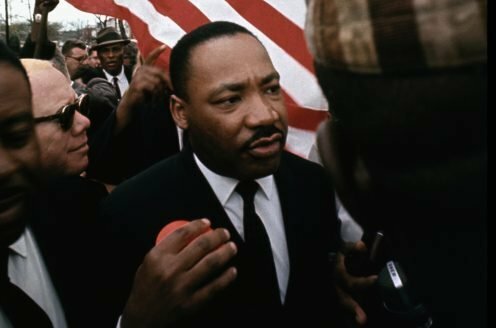 In 1986, the Movement established a Pan African Green Belt Network and has exposed over 40 individuals from other African countries to the approach. Some of these individuals have established similar tree planting initiatives in their own countries or they use some of the Green Belt Movement methods to improve their efforts. So far some countries have successfully launched such initiatives in Africa (Tanzania, Uganda, Malawi, Lesotho, Ethiopia, Zimbabwe, etc). In September 1998, she launched a campaign of the Jubilee 2000 Coalition. She has embarked on new challenges, playing a leading global role as a co-chair of the Jubilee 2000 Africa Campaign, which seeks cancellation of the unpayable backlog debts of the poor countries in Africa by the year 2000. Her campaign against land grabbing and rapacious allocation of forests land has caught the limelight in the recent past. Wangari Maathai is internationally recognized for her persistent struggle for democracy, human rights and environmental conservation. She has addressed the UN on several occasions and spoke on behalf of women at special sessions of the General Assembly for the five-year review of the earth summit. She served on the commission for Global Governance and Commission on the Future. She and the Green Belt Movement have received numerous awards, most notably The 2004 Nobel Peace Prize. Others include The Sophie Prize (2004), The Petra Kelly Prize for Environment (2004), The Conservation Scientist Award (2004), J. Sterling Morton Award (2004), WANGO Environment Award (2003), Outstanding Vision and Commitment Award (2002), Excellence Award from the Kenyan Community Abroad (2001), Golden Ark Award (1994), Juliet Hollister Award (2001), Jane Addams Leadership Award (1993), Edinburgh Medal (1993), The Hunger Project’s Africa Prize for Leadership (1991), Goldman Environmental Prize (1991), the Woman of the World (1989), Windstar Award for the Environment (1988), Better World Society Award (1986), Right Livelihood Award (1984) and the Woman of the Year Award (1983). Professor Maathai was also listed on UNEP’s Global 500 Hall of Fame and named one of the 100 heroines of the world. In June 1997, Wangari was elected by Earth Times as one of 100 persons in the world who have made a difference in the environmental arena. Professor Maathai has also received honorary doctoral degrees from several institutions around the world: William’s College, MA, USA (1990), Hobart & William Smith Colleges (1994), University of Norway (1997) and Yale University (2004). The Green Belt Movement and Professor Wangari Maathai are featured in several publications including The Green Belt Movement: Sharing the Approach (by Professor Wangari Maathai, 2002), Speak Truth to Power (Kerry Kennedy Cuomo, 2000), Women Pioneers for the Environment (Mary Joy Breton, 1998), Hopes Edge: The Next Diet for a Small Planet (Frances Moore Lappé and Anna Lappé, 2002), Una Sola Terra: Donna I Medi Ambient Despres de Rio (Brice Lalonde et al., 1998), Land Ist Leben (Bedrohte Volker, 1993). Professor Maathai serves on the boards of several organizations including the UN Secretary General’s Advisory Board on Disarmament, The Jane Goodall Institute, Women and Environment Development Organization (WEDO), World Learning for International Development, Green Cross International, Environment Liaison Center International, the WorldWIDE Network of Women in Environmental Work and National Council of Women of Kenya. In December 2002, Professor Maathai was elected to parliament with an overwhelming 98% of the vote. She was subsequently appointed by the president, as Assistant Minister for Environment, Natural Resources and Wildlife in Kenya’s ninth parliament. Maathai, Wangari, Unbowed : a memoir. William Heinemann, London, 2007.